Human Sundial - the reasons why it is so popular. pedestal-mounted, vertical wall-dials, 'armillary spheres', etc. which is a significant disadvantage of any 'traditional' sundial. and becoming unique 'conversation pieces' for their gardens. when other clocks are put forward or back in Spring/Autumn. Our "Sunclocks" (or Human Sundials) solve these problems. locations - and (if on grass) just run your lawn-mower over it. each "Sunclock" layout in the whole world is totally UNIQUE. or soft landscaping, within our Picture Gallery sub-sections. due to a variety of 'learning outcomes' and their interactivity. PERSON'S OWN SHADOW, to tell correct clock time all year ! which may place you in the same category as Stately Homes. This drawing, below, shows the concept of a 'Human Sundial'. You can click on it, to go to the opening page of our web-site. Many photographs, of "Sunclock" layouts, are also available. outdoor 'art' project - plus a useful and 'vandal-proof' feature. plus are also shown in School-books (both UK and America) ! since these are used as curriculum-wide sundials for learning. 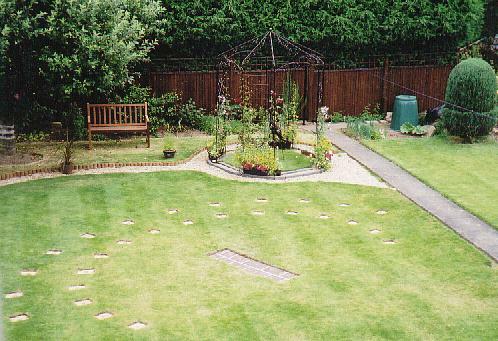 link to visit the MAIN WEB-SITE, for this 'interactive' SUNDIAL. for each of them), are shown within the 'Picture Gallery' on that web-site. You may also click on each of the pictures, above, for more information. perhaps purchase ready-made 'kits' (in a range of materials). You would even find out how to make some money, from it ! involved - and ALL the profits you make are entirely yours. E-mail using a home computer, without any 'physical' work. they act as their own advertisements, for additional orders. which become unique garden features for your customers. telephone, requesting to speak directly with Douglas Hunt. plus also give advice to suit your personal circumstances.